Kitchen Connoisseur: With everything needed for the chef and the guests, this remarkably large gourmet kitchen boasts a massive wood hood, a professional range top, double ovens, and a 10-foot long kitchen island! Gourmet Island: The darkly stained wood on the island contrasts beautifully with antique white cabinetry throughout the room. 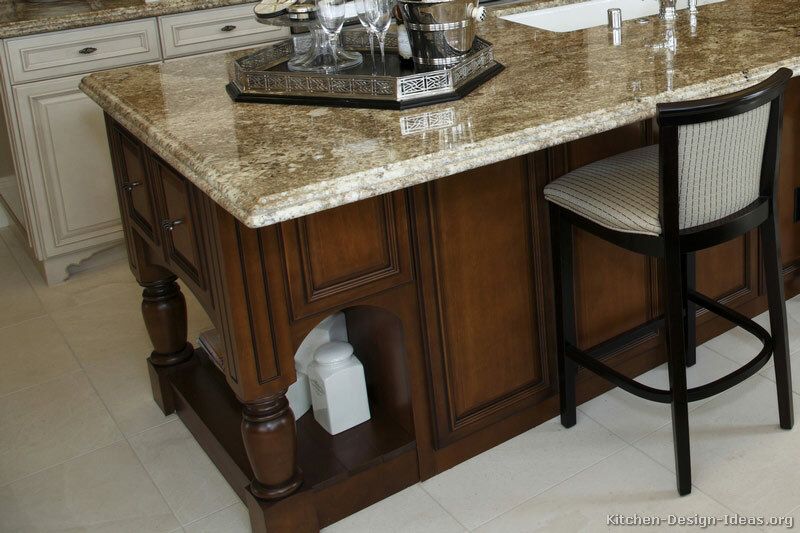 Centered on the island is a single-bowl cast-iron sink with a sprayer faucet and soap dispenser. Seating on the island, paired with the kitchen table in the foreground, allows ample room for entertaining in this large and luxurious kitchen. Kitchen Amenities: The 48-inch built-in refrigerator features custom wood panels and long handles. A butler's pantry just off the main room provides space for a built-in microwave and smaller serving appliances. 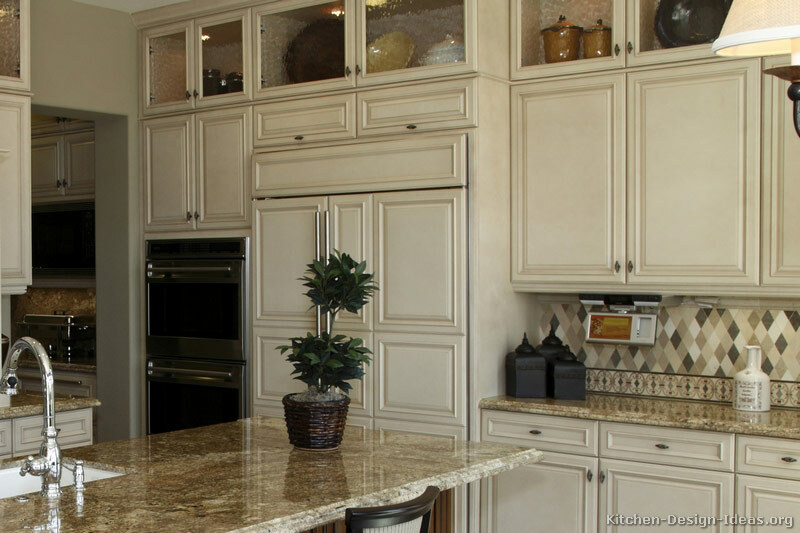 High ceilings allow for upper glass display cabinets without sacrificing usable storage. 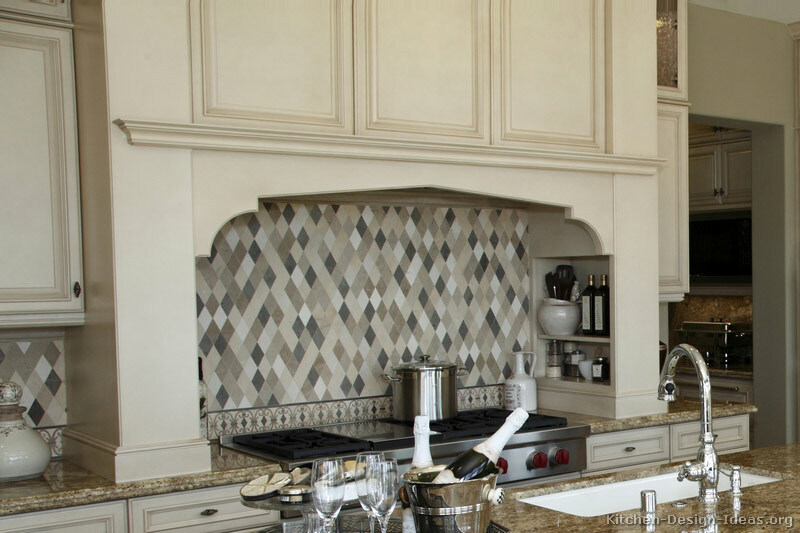 Decorative Woodwork: No detail is too small for this very large gourmet kitchen. 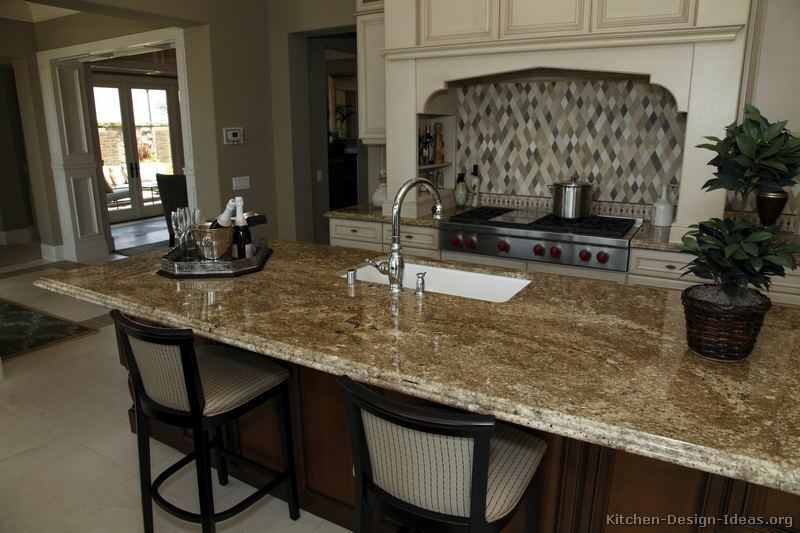 Custom wood turnings on the four corners of the island, along with open deck cabinetry on both sides, give this island the appearance of antique furniture rather than mere storage. Decorative end panels and arched furniture feet on the main cabinetry continue the more furniture-like appearance of the woodwork. 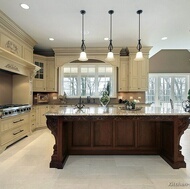 Beautiful Stonework: As with any unusually large gourmet kitchen such as this, a finer level of detail in the stonework keeps the spacious room visually interesting. 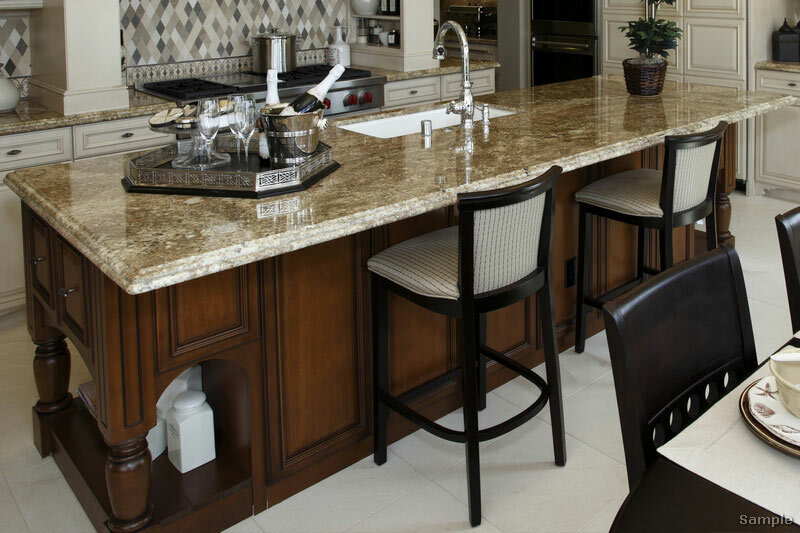 The swirling golden brown granite countertops are finished off with an intricate granite edge detail (a laminated ogee with a stepped bullnose), mimicking the look of a waterfall edge. 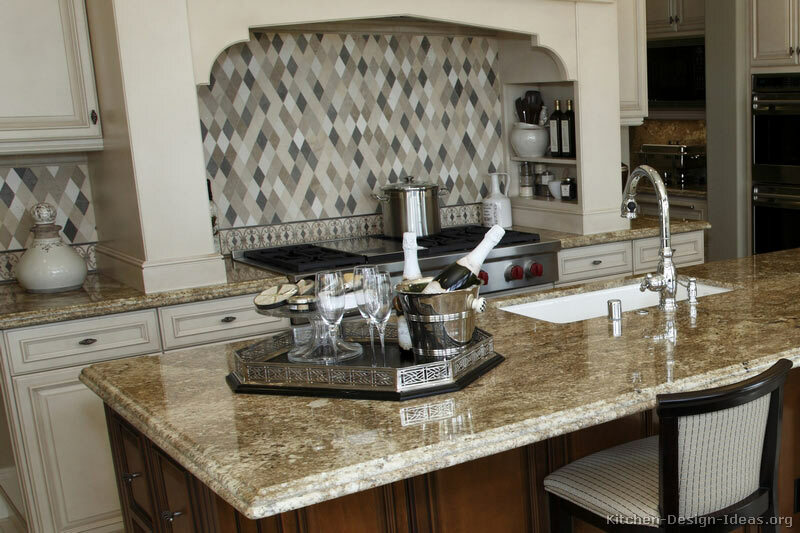 The diamond tile backsplash contains a vivid pattern of light and dark tiles, while a lower backsplash band possessing a more intricate pattern is stationed just above the granite. Light porcelain tile flooring and pale gray-green walls stay back in the mix, allowing the more prominent details to attract the eye. Mantel Style Range Hood: The large wood range hood, in a style reminiscent of a fireplace mantel, doubles as shelf storage for oils, spices, and cooking utensils, all stationed for convenient access next to the cooktop. A designerly arch keeps the wood hood out of head space while concealing the metal vent hood liner. 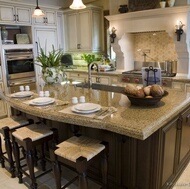 Related Pictures: This photo is #105 (on page 4) of the traditional Two-Tone Kitchens photo gallery. You may also enjoy our vast collection of Antique White Kitchens. 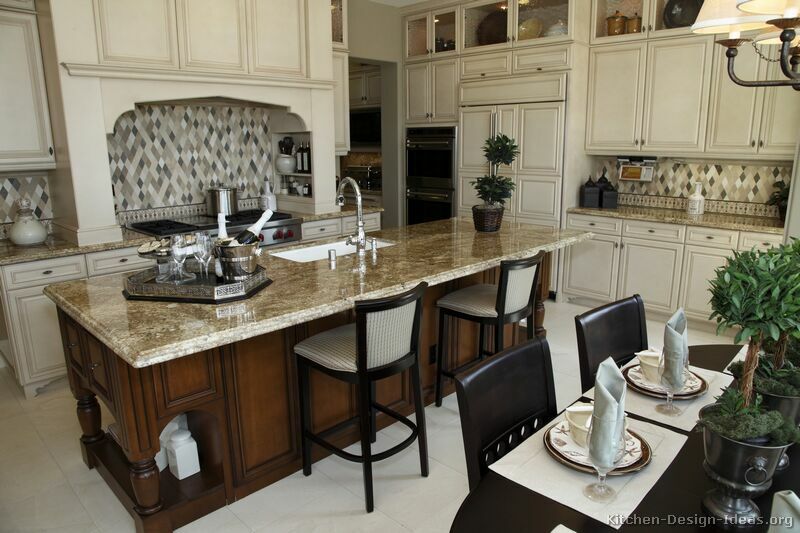 See similar photos and read our article featuring even more Large Gourmet Kitchen Designs. 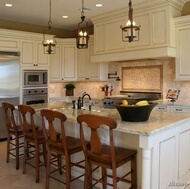 Daily Updates: To get Kitchen of the Day updates, visit Kitchen Ideas on Facebook and click "Like" to connect with us. Even More Updates: You should also follow Kitchen Ideas on Twitter to stay up to date with everything happening on this site. See you there!